After providing unsolicited advice (and more unsolicited advice) to Kevin Acklin, and wincing through, and then parsing, Yarone Zober's recent oratorical exhibition, I sense that providing unrequested advice to Mr. Zober would be the sporting course. First, stick to a statement prepared by someone who knows what he is doing (think: outsource). If asked a question, respond only as is essential -- less, if possible. 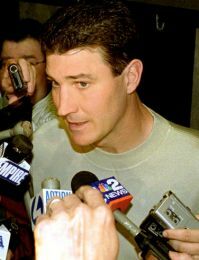 Think of Mario Lemieux, whose nature (and, I suspect, excellent training) leads him to pause and purse his lips after nearly every phrase, giving the impression that uttering another syllable would resemble birthing a jagged-edged bowling ball. Lemieux even nods silently at the end of every sentence or two, as if acknowledging an unseen coach asking him "why say another word?" Second, eliminate unsolicited, impromptu statements. Unprovoked ramblings along tangents are usually imprudent, particularly if your nature is to be disingenuous and you are discussing matters better (from your perspective, anyway) left unilluminated. Third, avoid easily refuted statements, such as "developers are abandoning downtown for Millvale" or "the city is growing" or "I will be hiking in solitude with my Lord along the Appalachian trail." Fourth, eschew readily ridiculed opinions, such as a claim that a handful of protesters, rather than national economic quicksand, is to blame for stalling hotel projects that were unable to get off the ground when the development environment was overheated. Fifth, devote special attention to steering clear of embarrassing topics and juxtapositions, such as describing job creation as the standard by which your administration's economic development policy should be judged on the day on which 150 years of continuous employment at a manufacturing facility is ending consequent to your administration's economic development activity. Finally, please feel free to disregard these pointers, and to start singing like a canary sitting on a sackful of seeds, if people identifying themselves as an FBI agent and a prosecutor's investigator pull you aside deftly and quietly indicate they would like to speak with you privately. Why Pick On The Post-Gazette? What's The Story On Tuesday's Planning Votes? City Still Looking To Refresh Iron City's Drink? Mixed (Up) Messages For God's Governors?